This recession will change the course of your career. Whether you're damaged or strengthened depends on the way you respond. Can you rise to the challenge? 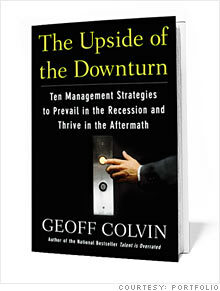 Adapted from "The Upside of the Downturn," by Geoff Colvin, with permission of Portfolio, a member of Penquin Group (USA) Inc. Copyright Geoffrey Colvin 2009. (Fortune Magazine) -- The recession that followed World War II was hard on everybody, but it was especially tough for Bill Hewlett and Dave Packard. Supplying equipment to the government had been a big part of their young company's business, and that revenue mostly disappeared when the war ended. Beyond that problem, the overall economic contraction that followed the drop in government spending meant that companies - HP's (HPQ, Fortune 500) other class of customers, since it didn't then sell to consumers - weren't buying either. The firm faced a crisis of survival. It was one of those moments when the behavior of a company's leaders in a brief period will determine its future for a very long time. As biographer Michael S. Malone has documented, Hewlett and Packard had built their business from the beginning on the principles of loyalty and trust, but in these circumstances they realized that they simply could not avoid mass layoffs. They fired 60% of their employees. Among the survivors, though, something curious happened. Those who remained were forced to stretch themselves in new ways. The company's manufacturing chief turned himself into a knockout marketer and was so successful that he remained in that role for the rest of his career. Even Packard himself found muscles that no one suspected he had. Though never considered a genius engineer - that was Bill Hewlett's role - Packard returned to the lab at this time when the company was desperate for new products, and he invented one. It was a voltmeter, the beginning of a product line that would serve the company quite profitably for 50 years. Packard never invented any more products; his genius was managing the company. But when a dire situation pushed him beyond his apparent abilities, he excelled. This recession is much worse than the one following World War II, and for millions of people globally it's a time of deep personal trials. Truly everyone is being stress-tested. Yet of the many opportunities that arise out of troubled times, the most valuable of all for many businesspeople are the opportunities for personal growth, particularly for developing as a leader. But the growth isn't automatic. Achieving it demands that we respond in the right ways. Turmoil presents the ultimate leadership opportunity, but for every inspiring story of James Burke and the Tylenol crisis, there's at least one less heralded tale of a leader who blows it. Coca-Cola (KO, Fortune 500) CEO Douglas Ivester happened to be in Paris in July 1999 when news reports said that cans of bad Coke had made several Belgian schoolchildren sick. Ivester, a brilliant financial executive with a sharply analytical mind, quickly determined that all production procedures were being followed and that his products did not pose any health risks. He got on his plane and flew back to Atlanta. But more people got sick, images of suffering children dominated TV news, politicians demanded action, and the mess eventually cost Coke millions of dollars plus years of distrust and bad will from all its stakeholders. It also contributed to Ivester's getting fired within months. In a crisis, he turned out to be a manager, not a leader. So what does true leadership under unimaginable stress look like? It can be boiled down to four actions. They're simple to state and may seem deceptively simple to do, but they aren't. Finding the strength to take these steps will contribute significantly to any leader's growth. 1) Be seen early and often. This most basic requirement is important for a fundamental reason that is often forgotten: People want to be led. The reasons we crave leadership are deep. We want the leader to be a repository for our fears. When people are desperately worried, they want to know that someone with greater power than theirs is working to solve their problems. Thus, successful leaders in a crisis first make emphatically clear that they are present and on the job. This kind of visibility isn't easy, because the leader in a crisis has a million things to do, most of which require being on the phone or meeting with small groups. In a business crisis, lawyers may be advising the leader not to make any public statements. Yet it must be done. Michael Dell's company was not large or well established in the early 1990s when he was scheduled to appear at a conference where I was moderating. The day before, Dell (DELL, Fortune 500) had announced unexpectedly terrible results. The stock had plunged, and some people wondered whether Dell himself, who wasn't yet 30, could lead his organization past this. The situation was so serious that most of us at the conference assumed he wouldn't show up. But he did, appearing unfazed and explaining his plan. Simply appearing reassured his constituencies and increased their confidence for the future. 2) Act fast. It's amazing how people who would be at one another's throats in good times will accept that in a crisis, decisions have to be made. Leaders in a crisis must not lose their rare opportunity to act. The difficulty is that just when decisions are most easily accepted, they're hardest to make. All business decisions are made with incomplete information, and that's especially true in the heat of a crisis. At the same time, the stakes are much higher than usual. Every instinct tells you to decide more slowly than usual, yet it's vital to decide more quickly. 3) Show fearlessness. When Robert the Bruce led the Scots against the English at the Battle of Bannockburn, he led them literally, riding a horse in front of the rest. As legend has it, a mounted English knight spotted him, lowered his lance, and charged. Bruce stopped and didn't move as the knight thundered toward him. Then, at the last moment, he stood in his stirrups, turned sideways, swung his battle ax, and split the passing knight's helmet (and head) in two. Bruce's troops were so inspired that they roared into battle and won the greatest victory in the history of their nation. We want our leaders to show us that they're not afraid. In business that means facing bad news head on without cringing. The effective leader announces trouble in unvarnished terms - people can smell evasion a mile away - then explains confidently how it will be defeated. Fearlessness can be shown more tangibly as well, when a leader cuts his own pay or, even more powerfully, uses his own money to buy company stock, as several CEOs have done in this recession. Note that the advice here is "show fearlessness," not "be fearless." A prominent CEO, who didn't want to be quoted for obvious reasons, told me, "Any CEO who isn't terrified in this recession has no sense at all." To suggest that you be fearless would be ridiculous. But what counts is what you show. Robert the Bruce was probably terrified. It didn't matter. 4) Tell a story that puts the crisis in context. Extensive research has shown that how people are affected by stress depends heavily on the way they see it. Those who see stressful events as bad, abnormal, and inescapable tend to suffer from them much more seriously than do people who see those same events as normal, interesting elements of life from which they can learn and to which they can respond. Some research has found that members of the first group suffer much worse health than those in the second group. The first group burns out more quickly and performs much worse than the second, even though both are subjected to the same stress. A critical question for leaders is whether they can help everyone in the organization respond more like members of the second group. The answer seems to be yes. When the stock market was dropping in late 2008, I asked Charles Schwab about it. He began his answer by saying, "I've been through nine of these darn breaks. This happens to be the most pervasive in terms of how it has spread through the economy." He went on to explain how it differed from previous market declines and how the market would eventually climb back up. This was precisely a group-two response, starting with the idea that what some investors considered financial Armageddon was really just part of a very long pattern. His overall message was that this is interesting and something to which we're all capable of responding. These four steps may require you to stretch beyond your comfort zone. And that is exactly the point. Research has established that what turns average performers into great performers is a process of being continually pushed just beyond their current abilities, and then responding to the new challenges with focused efforts to overcome them, accompanied by abundant feedback about the results. But constantly attempting what you can't quite do, which is the essence of the process, is a recipe for trouble in most jobs. It means that you will inevitably make mistakes and have failures. Now if you ask accomplished businesspeople, as I have often done, whether they learned more from their successes or their failures, 100% of them will say the latter. But most employers don't want to hear that your mistakes have been an absolutely necessary part of your growth. They just want you to perform. So that's what most people do in their jobs, operating entirely within their comfort zones and as a result not getting any better. We know this not just from observing it in our own workplaces but also from considerable research showing that most people improve rapidly in the early days of a given job, then plateau, and may continue for years thereafter without progressing. Seen against this backdrop, the precise nature of this opportunity is clear. The recession, by pushing everyone past the limits of his or her current abilities, places us all on the first step of the process. Whether we take the next steps is for each of us to decide. Certain practices that are always valuable for a business actually become easier to adopt in a recession. 1) Evaluate employees better. In good times it's easy for employees to look like stars, so evaluations tend to become less rigorous. Managers are fooled into believing they've assembled all "A" players. In tough times it's much easier to distinguish the true stars from the third-stringers. Just as important: With the unemployment rate rising, employees are much more inclined to take evaluations seriously. 2) End guidance. Telling investors what quarterly earnings are likely to be, then talking that number up or down as the quarter progresses, and then contriving to beat it - that corporate game has never served a useful purpose and can lead to much harm as managers feel pressured to hit announced targets. That's why such respected firms as Aetna, General Electric, Intel, and Unilever have stopped giving quarterly guidance in recent months. 3) Manage for value. In good times your company's performance is probably attractive almost any way you look at it. Now it's more critical than ever to focus on what really matters, which is earning a return on your company's capital that exceeds the total cost of all the capital in the business. If that seems painfully obvious, please stop and reflect on whether you or anyone in your business is being paid explicitly for achieving that goal. Most employees at every level are paid to hit other targets - salespeople have sales quotas, plant managers have quality goals, even the CEO may be focused on reported earnings per share. None of those goals is the same as value creation. 4) Expand your mind about risks. The most dangerous risks your company faces are the ones no one wants to address. That is always true; now the trauma of this recession has made it far easier than it has been for years to talk about unimaginable risks. 5) Mine employees for ideas. Potential improvements can hide in a million places. Staples recently found $21 million of efficiencies in the way it runs its warehouses. When I asked CFO Christine Komola how they knew where to look for the savings, she replied immediately, "Ask the associates. They know."